This weekend my friends played a couple of battles, unfortunately I could not participate. 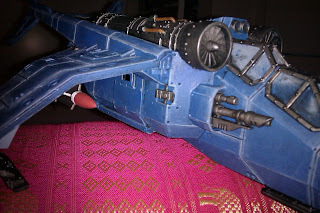 I did my duty, witch is painting on my Valkyrie. I'm a little bit closer to the goal, the finishline is still far far a way. This is as far I have reached right now. As you can see all weapons are magnitized. I'm thinking of making a ladder for the cockpit but have not decided how. 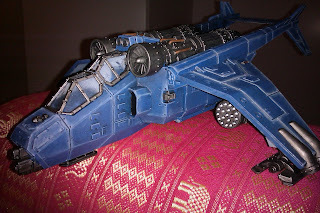 One way is to make it of a wire, I also got a couple of steps from a Leman Russ that is possible to use. The problem with the later version is that I only got four of them when I need six. So it will probebly be handmade of wire. Important to make them all look alike. Still need tips for the windows! Now you know how to paint the windows. It helped me a bit. Maybe after another painting-session I be pleased. Maybe tonight, but just maybe.